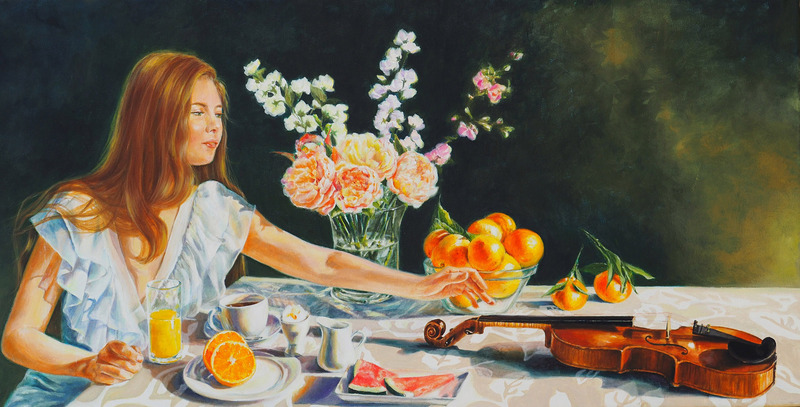 Diana Battefeld, Self-Portrait: The Breakfast, 50×100 cm, 2018, [Oil on Linen]. There is nothing in the world like music. And there is nothing in the world like making music. The act of playing an instrument uses the entire brain, the entire body even. For the slightest tension in your little toe can have an effect on your play. When I play, I become one with the instrument and I get blissfully lost in it. I no longer exist; there is only sound. For this reason, I am convinced that playing an instrument is the only way to curtail PTSD, but that is another story . Over the Holiday season, I played the violin non-stop with hardly any breaks. Three hours of practice appear always to be just like three minutes, and hunger and thirst are not part of my existence. Every musician knows how hard it is to stop when one is in the middle of a breakthrough; the anticipation of finally getting it is too great to stop before it’s realized. But, sadly, we are only human. There is always a new piece, lots of practice, repetitive movements that strain the hand, fingers, shoulder, arms … one more measure becomes one more measure and so on. Around January 1st, I couldn’t play anymore. Vibrato was impossible and eventually I could hardly press the strings on the fingerboard. Then came the regrets: If only I had stopped in time! If only I had not ignored that tiny tingle I felt a week ago! If only I could just play without vibrato. I would be happy just to be able to press strings down! These are misapprehensions of an incorrigible addict! I don’t know what was more painful, the physical pain or the emotional pain of perhaps not being able to play … ever again! For the thought swamped my thoughts every waking minute. I waited a week without touching the violin, looking at this beautiful, torturous box of wood, pining, yearning, longing to make it sing. A week turned into a month. I would wake up in anguish in the middle of the night, bend my finger in hopes the pain was gone, and crash back into my pillow in fatalistic despair. No more violin. Ever! I turned to the piano with the same passion and intensity. The addict always searches for an alternative source of high. Mozart’s piano sonatas were a delightful respite, but I could only play the Andantes at less than 70 bpm. It eventually became strenuous on my finger and I had to stop it too. A month turned into two. I couldn’t even listen to music anymore; it was too agonizing to my ears. I painted the self-portrait above, The Breakfast, while I was in pain and my violin stared back at me mockingly and contemptuously. In the absence of music, I always turn to painting. I do not find painting an intellectually stimulating endeavor in the least. It is too easy, too boring, a child’s play at best, and I never lose myself in it, but it allows me to leave a physical mark of my state of mind on a canvas. After three months, I decided to go to a series of doctors. No one knew what was wrong with my finger. An x-ray showed it was not broken. Some thought it was an infection, others a sport’s injury. I had anti-inflammatory medication for 2 weeks; it did not work. I had ultrasound sessions for 4 weeks; it did not work. I had physical therapy for 2 months. 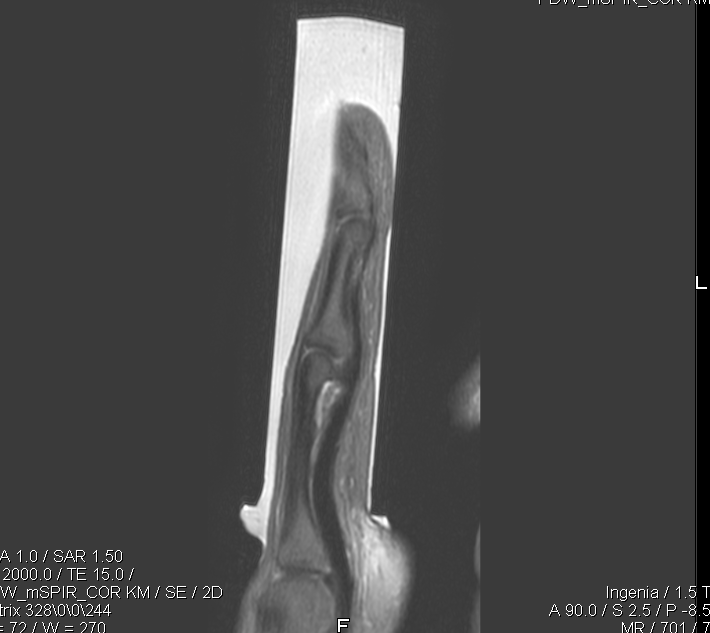 The MRI photo below shows what was wrong: the extensor tendon on the middle phalanx was torn. A hand surgeon told me that there was nothing anyone could do, but wait. I had to wait 9 months! My finger eventually healed and I could play again, but I am no longer completely indifferent to the fact that I am only human. 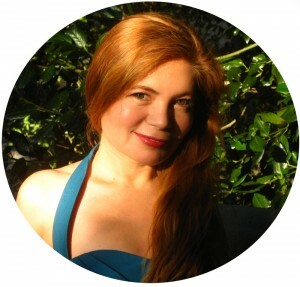 © 2015 Diana Battefeld. All rights reserved.